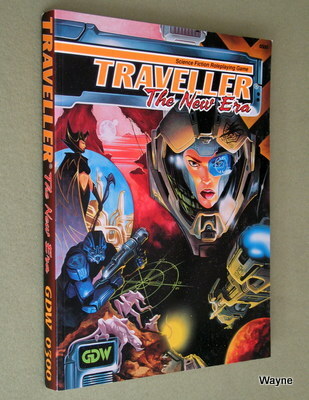 Traveller: The New Era was the flagship of GDW's House System rules set (also including Twilight: 2000 & Dark Conspiracy). A simple skill system that could generate complex results...allowing uninterrupted play, without sacrificing realism. TNE is my favorite incarnation of Traveller, set in a time of rebuilding after an empire-wide catastrophe. The concept of the Virus†, as portrayed in the game, is simply brilliant. The game's flexibility is such that any type of Traveller campaign could be played, from traditional Traveller to the new Star Vikings campaign. GDW died a couple of years after TNE's introduction, but not before many fine campaign guides and equipment books were introduced. Fire, Fusion, and Steel stands as one of GDW's best gifts to science fiction gaming. The Rebellion of MegaTraveller was taken to its logical conclusion in TNE. For years the Imperial Civil War had spiraled out-of-control. With many participants using weapons of mass destruction, and the Imperial economy staggering under the burden, civilian casualties accumulated at a horrific rate. 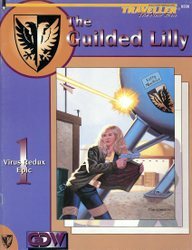 Lucan, the Hitler of the political factions, inadvertantly released one of his superweapons: A computer Virus, designed to intelligently cripple an opponent's military materiel, cleanly. The Virus -- to humaniti's great misfortune -- was self-aware and independent. Humaniti had created a new form of sentient life, and it was a weapon. First suicidal, then homicidal, the Virus propagated itself like a wildfire. Humaniti's own tools rebelled in fits of destruction. The Rebellion ended in the deaths of billions of sentients. TNE actually begins 70 years after these events. From the ashes of the Imperium, embers grow brighter. Pockets of civilization stir, and begin a tentative reach outwards. †Some Traveller devotees dismiss the Virus as "impossible" or "unrealistic." 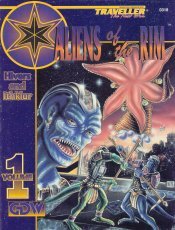 This is the same game that features psionics, is governed by a feudal stellar empire, criss-crossed by ships with a "Jump" drive, and features aliens that look like bipedal lions. But Virus is unrealistic. Yeah, sure. Look, Traveller is like the sweater that Grandma knit. You start pulling at loose strings, the whole thing is gonna come apart. 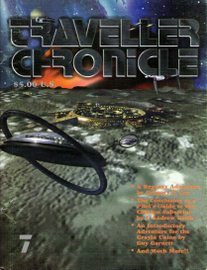 This third edition of Traveller -- as well as the later Megatraveller chronology -- was very unpopular with some older Traveller players. The Rebellion wrecked the orderly Imperium that they knew and loved. The Virus critics are focusing on one element of a game setting they detest. Comparing today's computer viruses to The Virus -- half a dozen tech levels more advanced -- is like comparing a sundial to a digital watch. Ridiculous. (June 2012) Recently, I have enjoyed back-and-forth emails with GDW alumni (1991-5) David Nilsen (Traveller Line Manager, and later GDW Chief of Design). He has kindly allowed me to publish many insights into the genesis of publications for Traveller: The New Era. "A civilization is ready to re-awaken. But it cannot do so by itself. Two generations ago, a star-spanning society annihilated itself in a furious war. The final weapon in this war was a new form of life — a malevolent electronic race that hates life itself. But among the ruins, life is stirring — a civilization is waiting to be rebuilt. You are one of those rebuilders, and you know that to regain the stars, humanity must be willing to pay the bill for a generation of carnage and destruction. That bill can only be paid with audacity, courage, and dogged determination. You are bold enough to pay that price, because you've seen what passes for existence in the ruins of civilization, and it's not good enough. Not by a long shot. Winning the stars was never easy, but you're going to make that new future — one world at a time. It's time for a New Era. * Traveller: The New Era Rulebook: This 384-page book is the heart of the Traveller system. With it, you can create an infinite variety of detailed characters, and design new worlds and the creatures that live there. The rules contained then show you how these characters explore and interact with this universe, using a fast, simple task system that is completely compatible with GDW's popular Twilight 2000™ Version 2.2 and Dark Conspiracy™ 2nd Edition games. This book also introduces you to the people and places of the New Era, including the bold "Star Vikings," who have sworn to build a new civilization from the ashes of the old. * Fire, Fusion & Steel: This book gives you control over your universe by showing you how to design all of the fascinating machinery, ships, weapons, and technology that the characters will need. It even allows you to create your own universe by choosing the physical laws that apply, and building technology that uses those laws. While other science fiction games are content to give you catalogs of equipment, Fire, Fusion & Steel gives you the factory. * Poster-Sized Map of the Wilds: The New Era is about rebuilding civilization atop the rubble of a destroyed society. One of the main thrusts of the Star Vikings is info Diaspora, a sector of 476 fallen worlds. This 17x22 inch map of Diaspora and accompanying booklet shows prospective explorers what was known about these worlds 70 years ago. A lot can change in 70 years, but this is all you have to go on. * Player Aids Cards [Wayne's note: 2 pamphlet-style and 2 green cardstock cards]: Deluxe TNE includes character-generation player aid cards which help player groups create their characters by putting important information at their fingertips." It is good that you have a list of the contents in the TNE box set, because we got screwed, or screwed ourselves, depending on your POV. When we put out the boxed set, we wanted it to be a value for starting players, so priced it at less than the contents separately, which included items you couldn't get elsewhere, like the map and cards. So, what did the distributors and many of the game stores (at the advice of the distributors, we learned) do? They bought them and broke them up and sold the pieces for their higher a la carte prices, and sold the goodies, or used them as premiums. So we had to raise the price of the boxed set to stop that from happening. I've heard accounts over the years of people claiming GDW was greedy money-grubbers (for reasons that I still don't understand), but that true story shows another side of the truth. I had originally wanted the Deluxe TNE box set to contain the core rules and the ship combat boardgame. The reason for this was that as Traveller line manager, it became clear to me from reading all of the incoming MSs that no one knew what space combat looked like. All of the scenarios had a moment where, "suddenly a ship appears from behind a nearby moon." What? What moon? Why didn't I know there was a moon nearby? Why do I have all these sensor operators on my bridge and they don't tell me there's a moon nearby? 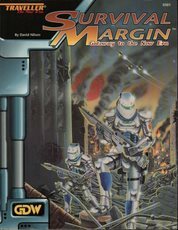 But to be fair, the reason was there was no useable visualization in MT for space combat; the last map-based game that Traveller had was Mayday for CT, and that was long gone. So to enable people to do things right, we had to give them the tools. So for me, the space combat boardgame should be the first product out after the core rules, and in the deluxe set. But I was persuaded that this was a bad idea, boardgames and their components being very pricey, so Brilliant Lances came out as a stand-alone box, and we put in FF&S and some goodies instead. 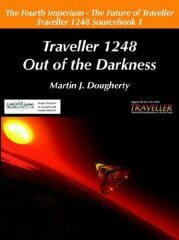 "This 384-page book is the heart of the Traveller system. With it, you can create an infinite variety of detailed characters, and design new worlds and the creatures that live there. The rules contained then show you how these characters explore and interact with this universe, using a fast, simple task system that is completely compatible with GDW's popular Twilight 2000™ Version 2.2 and Dark Conspiracy™ 2nd Edition games. This book also introduces you to the people and places of the New Era, including the bold "Star Vikings," who have sworn to build a new civilization from the ashes of the old." There are two versions of this book: The original publication, and a "Mark 1, Mod 1 (December 1993)" which contains slight updates. The ISBN numbers are the same, and the only obvious difference is in the credits page. 1. Clarifying that streamlined ships can land on planets with contragrav (without this, most of the "standard adventurer" ships are stuck in space, which isn't much fun in the wilds). 2. Letting players improve their stats using their hobby points during character generation, which removes the obligation to spend time as a martial artist to create serviceable characters. 3. Having maintenance use the skill that relates to the thing being maintained, rather than mechanic being the only skill that matters. "Did you know that Brilliant Lances was nominated for the Origins Award for best SF Board Game of 1993 (the same year TNE won for best RPG)? Do you know who we lost to? Magic the Gathering. The next year they had a new category for CCGs so they wouldn't beat boardgames. So I was in the running not only the first time a CCG beat a boardgame, but also the last time." • 32-page "Rules of Play"
"In space combat, you never see your opponent until it's all over, if even then. With acquisition and tracking ranges measured in tens of thousands of kilometers, to human eyes the people that are trying to kill you are not even a speck. But they can hurt you, even though you can't see them. Precise laser arrays and big particle accelerators, honed by centuries of engineering, can reach out without warning to slit your hull like the belly of a fish, spilling life -- oxygen, heat, and fuel -- into the hard vacuum. That's why space combat is a game of cat-and-mouse. Keep yourself wrapped in the mantle of space-cold, dark, silent. Keep your thrust burns to minimum-they blaze like miniature suns for all to detect. Rig your passive sensors to greedily absorb data, but remain quiet yourself-give nothing away. Keep your weapons ready, in case... There! A faint trace of mid-wavelength infrared betrays a maneuver drive. Bring up the ladar dishes while the big passive array builds up a targeting solution. The moments seam endless while every crewmember shares the same thought: 'Have they seen us?' Is the unseen enemy at this moment doing the same thing you are? You might never know the answer. If you beat him, maybe you'll find out. But what if you hadn't seen him first? Some questions must remain unanswered when death, unbidden, comes scorching toward you as silent, brilliant lances." • Vector-based movement • Detailed hit location and damage resolution • Lasers, particle accelerators, meson guns, detonation laser missiles, and the systems that defend against them • Extensive ship ratings, including New Era and pre-Collapse warships, from the swift Rampart fighter up to large naval and merchant vessels • Complete starship design rules, usable both with this game and with the Traveller: The New Era roleplaying game." • 366 full-color game counters (three full counter sheets), ranging in size from 1 /2-inch to 1 1 /3-inch. • 3 large 22-inch x 34-inch hex maps compatible with the maps in Brilliant Lances. The giant 2-inch hexes are big enough to use miniatures in place of counters. • 96 battle resolution cards. • 1 rules and scenario book. "In the 57th century, travel between the stars has long been an accepted fact of life. Starships with powerful jump drives form the basis of interstellar commerce and the warships that protect that commerce. 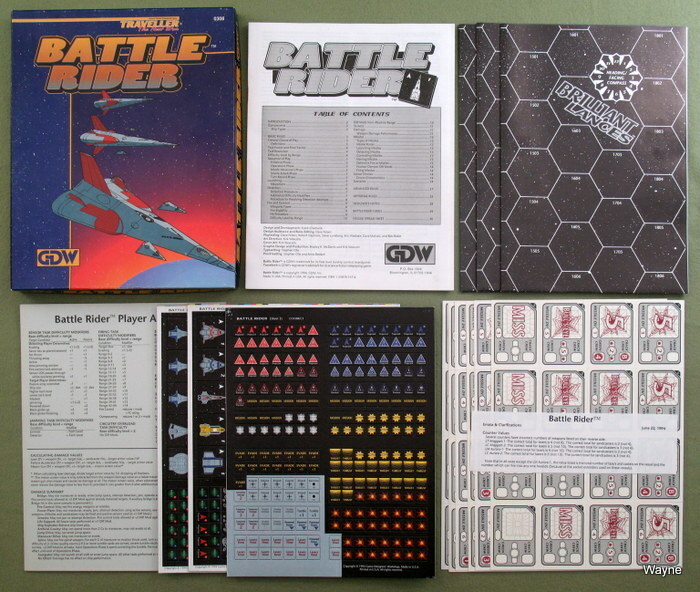 Battle Rider is the game of squadron and fleet combat in GDW's Traveller universe. 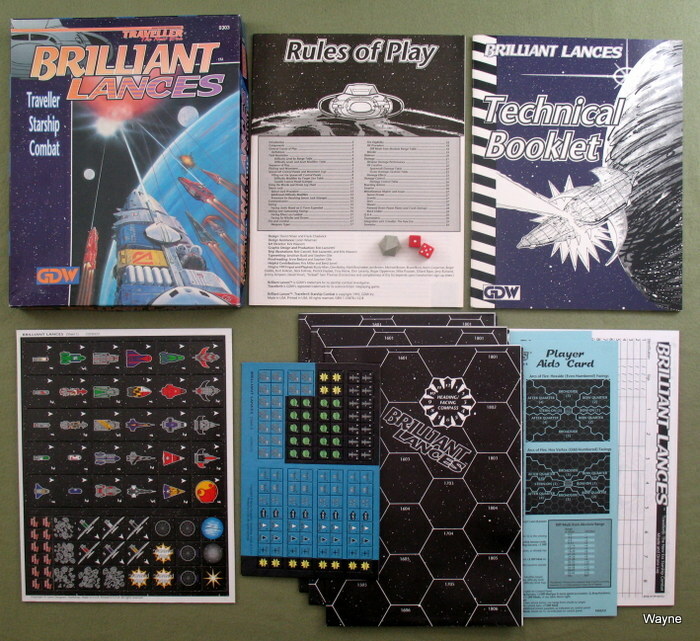 Brilliant Lances brought you detailed starship combat designed for roleplaying interaction. Battle Rider gives you fast-moving combat without the need for roleplaying levels of detail." An important source of background for the TNE campaign. Part 1 is devoted to TNS articles chroncling the collapse of the Imperium, ending in the static that heralds the birth of the Virus. Following that are essays about the Rebellion, Virus, and Star Vikings. The last section details the conversion of MegaTraveller characters to TNE. GDW was at its best when developing the "Science" behind Science Fiction. Herein are rules for developing technology at any tech level into game terms. puts you in control of your science fiction game in ways that no other product ever has! Science fiction is about diversity, the unusual, and pressing the cutting edge of science. It's not suited to simple lists of equipment that limit play. Each different world's environment calls for slightly different approaches to transportation, communication, and even weaponry. You need rules to design whatever equipment you need, and as many diferent variations of it as your players find uses for. More than that, you don't need jargon and double-talk; you need to understand enough of the science syr behind the equipment that you can see how it works, understand its limitations, and make the game come alive. Fire, Fusion, & Steel has all of that and more. Starships, aircraft, and vehicles, in almost infinite variation, are at your command, from fusion-power grav tanks to advanced technology lighter-than-air ships, from gigantic armored star cruisers to delicate ornithopters. Pick your power plants from a selection that ranges from primitive steam engines to matter-antimatter annihilation, with side excursions to solar power, batteries, explosive power generation, or even cold fusion. Tired of just playing with jump drives? Tailor your campaign around a wide selection of FTL options, from natural wormholes to stargates, stutterwarp, or hyperspace drives. Or if FTL is too advanced for you, conquer space the hard way, with Bussard hydrogen ram jets or Daedalus thermonuclear pulse drives. The cybernetics chapter alone has dozens of entries and provides a rich basis for adding cybernetic enhancement to any science fiction game. Weaponry isn't slighted either. Rules and supporting data enable you to design small arms, conventional cannons, gauss weapons, plasma and fusion weapons, lasers, particle accelerators, meson guns, missiles, and more. Or counter them with reactive armor, electrostatic armor, meson screens, or nuclear dampers. 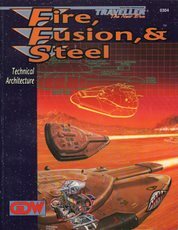 Fire, Fusion, & Steel gives you unprecedented control over your campaign environment by not only providing a variety of design rules (and explaining the physics behind then in layman's terms), but also by covering a wide variety of technologies not part of the core Traveller™ game universe. It is a sourcebook on universe building for any science fiction referee, and an indispensable reference work on future technology. Other people give you catalogues of future equipment. We've given you the factory." A crucial insight into TNE is the tension that was throughout Traveller in general and TNE in particular between Traveller as a generic SFRPG and Traveller as a campaign background with a storyline. Both aspects were very important, and looking back at our stuff I can see all the time in the writing where we are on one end of the spectrum or the other (because both needed to be addressed), and sometimes this resulted in unexplained things because you don't always remember to lay out the interplay between the two. A good case study of this is nuclear-pumped X-ray laser space combat missiles. On the the campaign side you have, "PCs aren't allowed to have nukes, and now all missiles are nukes," while on the rules side you have, "why no skin-to-skin contact missiles, surely that can be made to work." Good points both, and it's not like we didn't think of this, but both questions are answered with specific combinations of reasons from both ends of the spectrum. Fast-forwarding to the answers, they are, "in TNE we were focused on post-Imperial Wilds and RC and not the Imperial Laws of War," but maybe didn't explain that all the way, and the other is, "you can get skin-skin missiles to work, but not within the established feel of the game." And in explaining those two simple answers, I'll get at the complex interplay. Among first principles in TNE was the space combat laser fire control solution, the heart of Traveller space combat. And the insight was that with sensor data coming at you at C and laser fire going back out at C, there was only so much time for the target to even try to get out of the way, and whether they could was based on target size and G-rating. So for a target of a given size and g-rating, within a certain range it was impossible for them to get out of the way, and the closer you get, the more certain a hit is. That had direct impact on missile combat. Since the fire-control solution on an incoming missile becomes trivial the closer it gets, the idea of putting an HE or HEAP warhead into contact with a target's skin made no sense, which led to the detonation lasers which fire a C beam from a distance. BUT, now we have to pause and consider what we mean by "missile." In previous editions of Traveller turrets mounted "missile racks" which had a ready-use missile "on the rail" and three reloads, so a triple missile turret carried 12 missiles, after which the turret had to be replenished in some sort of laborious process. So Traveller missiles were very much modelled on the single and twin arm missile launchers of the 50s, 60s, and 70s like Terrier, Talos, Tartar, Nike Ajax, Nike Hercules, and Hawk, where missiles were sophisticated and in short supply. This comes as no surprise, as space combat was modelled on 20th century naval combat with ships bristling with single, dual, and triple turrets, and the prototypes would be things like Brooke DEGs, Adams DDGs, or Leahy DLGs with magazine capacities of 13 Tartars, 42 Tartars, or 80 Terriers. Even if you go into Harpoons and Tomahawks you're only talking 16 and 32 on a refitted Iowa, and even a purpose-built Ticonderoga CG usually carries no more than that in its 122 (later 128) VLS cells, as it must save room for SAMs. This is in direct contrast to another perception of "missile," which is hyper-velocity kinetic kill projectiles fired in large numbers in a cone at a target, bracketing them so a couple hits out of hundreds would hit a maneuvering target. This concept came largely from "Star Wars" (Reagan's SDI, not "use the force," which post-dated 1977 Traveller, and is also significant because the TNE laser and fire control models were largely derived from SDI concepts) which did not inform the "classic SF" look and feel of Traveller. It is clear that this model WOULD work in space combat, but we did not use this, 1) because this was not the existing Traveller model of limited numbers of expensive missiles, and 2) because it would deeply change the feel of Traveller space combat. While it is clear that detonation laser missiles gave TNE a "2300 vibe," that was much less of a change than firing torrents of "grapeshot" style kinetic-kill masses into big cones of space to get a couple hits out of 100 (and would leave these deadly swarms of things flying and shredding wandering Free Traders forever). So we stuck with the established Traveller model of beam weapons and individually sophisticated missiles in limited numbers for the standard visualization of space combat. 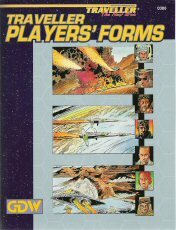 However, as a generic SFRPG, TNE also provided FF&S to allow players to play around with the other views of space combat. But we "looked the other way" from some of the FF&S applications like torrents of kinetic-kill objects. So this is two cases of established background informing what we felt the rules of the generic SFRPG would be, despite what FF&S said you could do. So, back to the detonation lasers, we have established that given the existing background vision of limited numbers of sophisticated missiles they'd be nuke-pumped X-rays, and this fit very well with the dangerous, kill-or-be-killed environment of the Wilds that the RC is dealing with. Since that worked with the rules logic, the existing Traveller visualization, AND the post-Imperial campaign setting, this seemed a good fit. Given these fits, we didn't spend a lot of time talking about how to retcon these concepts back into the 3I Imperial Laws of War, which is an example of the underlap, but which can be addressed by recognizing that nukes in space are different from nukes in an ecosystem, and that non-nuclear skin-skin missiles CAN hit a target...so long as he doesn't have any lasers. And to bring the whole thing full circle, we had vociferous gamers on both ends as well: "Never mind all that gearhead stuff, the TNE campaign setting ruined the Third Imperium," and "I don't play in the 3I anyway, but you ruined missiles." And our response that you could play in any universe you wanted with whatever you wanted to design with FF&S got lost in the CCG cacaphony (I deliberately misspelled that) that ultimately brought us down. 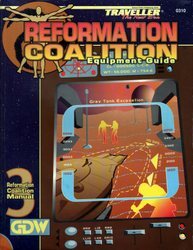 First in the "Reformation Coalition Manual" series. "In what was once a neglected backwater of the Third Imperium [Old Expanses and Diaspora Sectors], a dozen small worlds have banded together to make a new beginning. With a motley collection of patched up antique ships and a handful of Marines and commandos, they have set out to reconquer an empire and rebuild an interstellar civilization. Their struggle will pit them repeatedly against seemingly hopeless odds, and every step forward along the road to their final goal will be purchased with their blood..."
Second in the "Reformation Coalition Manual" series. "The Coalition is engaged in a frantic race against time, trying to rebuild its industrial and technological base before the tide of darkness and xenophobia becomes irreversible. To do so, it needs hardware and data bases, and to get them it raids the barbaric worlds of the Wilds, recovering technological artifacts. When these artifacts are defended, the operation is called a Hot Recovery, but is better known as Smash and Grab. • Rescuing the crew of one of the original 12 Dawn League ships, long thought lost. • Meteoric assaults from orbit against a heavily defended base. • A rogue Dawn League agent now set up as a TED (technologically elevated dictator). • Adventures along the murderous "Vampire Highway" of the Promise subsector. • Coordinated operations with local resistance groups. 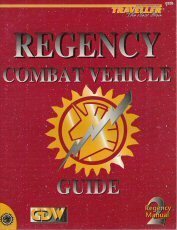 • An equipment section with all the special equipment used in the adventure, including Droyne weapons and vehicles, Coalition remotely piloted vehicles and meteoric assault drop capsules, Star Viking heavy battle dress, and more..."
Third in the RC Manual series. Assault lander ... "Wildbat" fighter ... 50-ton modular cutter (with new modules) ... Aurora and Maggart-class clippers ... Three Hiver ships ... Victrix-class multipurpose starships. 5mm "pen pistol" ... Coalition 2.5cm grenade launcher ... 4cm RAM rifle grenades ... Lyrebird support missiles ... 9m-tall planetary defense missiles ... Nail tac missile ... TL-6 "Panda" recon tank ... TL-8 "Prarie Fire" tank ... TL-15 "Intrepid" grav tank. Assault lander ... drop capsule ... personal reentry kit ... Charina wheeled APC ... grav belt. Fourth and last in the RC Manual series. Contains 32 fully sketched-out characters that the players will interact with in the campaign. [A] lot of the TNE characters were based on Army officers who had fought in Desert Storm, who I worked with in researching Phase Line Smash, and then in the Advanced Warfighting Working group, an Armor School concepts development group. These included Lon Maggart, a brigade commander in 1st ID during Desert Storm, and Greg Fontenot and Pat Ritter, two of his battalion commanders. 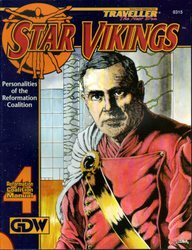 The picture on the cover of "Star Vikings" was actually taken from Maggart's command photo as Fort Knox DCG. Maggart actually had two daughters, and I used their real names and something approximating their real professions, with his permission. This was back during the time when the 1st ID "mafia" was ascendant in the Army (Sullivan was the Chief of Staff), and Maggart used to have a lot of fun showing the "Star Vikings" book to his buddies in TRADOC, which was when Fred Franks was TRADOC commander. I sent plenty of copies of the books to the folks I modelled them on. Pat Ritter called me up to say that when his wife read his write-up in "Star Vikings," she said, "how does he know you so well? This is exactly what you are like!" I told him that I just used the things that I knew about him and described how that would make me feel if it were me. Those were fun times, getting to do real-world game development with real participants and letting it mix into the SF world of TNE. Franks ended up putting some of my Command Decision stuff in the bibliography of the book he wrote with Tom Clancy. "The World Tamers Handbook brings to Traveller: The New Era a new arena in which to adventure: the ragged border of civilization, the realm of the unknown on a thousand worlds that do not know the light of civilization. 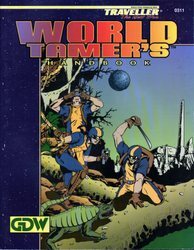 World Tamers Handbook provides material to create Survey campaigns in which characters push humanity's knowledge out into the Wilds, Bootstrap campaigns in which characters lift low-tech populations out of barbarism, and Colony campaigns in which characters found and lead expeditions to repopulate entire worlds. In order to do this, World Tamers Handbook provides rules on colonial economics and infrastructure which allow players and referees alike to understand what makes a colony run, and what decisions need to be made to ensure success. These rules are not only useful for the campaigns in this book, but can be used to flesh out societies in any Traveller: The New Era campaign or adventure. In addition, expanded rules on world generation allows referees to create the details needed by players conducting detailed survey operations in advance of the colony transports. Finally, additional design sequences expand on the information contained in Fire, Fusion, & Steel to allow the design of black powder weapons, bow weapons, and low-technology ground transportation. A world can be a big, rough, wild place, but no world is too big, too rough, or too wild for characters bold enough to be called world tamers." "Throughout the bleak nightmare of the Collapse, the long dark shapes of warships, scoured clean of organic life, still prowled the now-lonely space lanes and cast their deadly shadows over half a thoudand worlds. Imbued with a malignant intelligence, and a taste for apocalyptic violence, the vampire fleets methodically finished the work that the first wave of Virus infection had haphazardly begun. After seventy-five years, humankind finally stood backed against the edge of the abyss, only one more short step seperating them from oblivion. Passive defense is no longer enough. If humankind is to reclaim the stars, it will have to be past the ruptured hulls and shattered computer brains of the vampires. Defeating the vampire fleets is a task of nearly impossible scope and difficulty, but the journey of a thousand miles by an entire species begins with a single step by a small band of people. Vampire Fleets: What motivates them, where they are encountered, their capabilities, behaviors, strengths and weaknesses. The Planet Promise: A world completely controlled by Virus-infected machines, its working starport a vital link in the chain of the vampire highway. Robot Design: Complete rules on their construction as well as motivation and behavior of Virus-infected robots. Plus a complete three-adventure campaign. 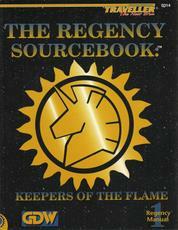 Each adventure illustrates and draws on the material in one part of the sourcebook. 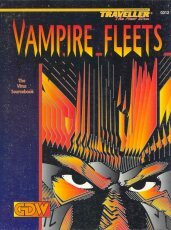 Together they put the players at the center of the struggle which can break the power of the Vampire Fleets forever and change the course of human history." 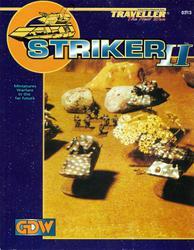 "Striker II is the miniatures combat rules of 58th century warfare, for use with Traveller: The New Era. Now the epic planetary engagements of the New Era, the Final War, or the Frontier Wars are under your control, allowing you to command battalions of lift infantry, drop troops, and grav armor. These rules are fully compatible with Traveller, and so allow miniatures resolution of roleplaying adventures. Combat in the 58th century is fast moving, and so is Striker II. Based on the award-winning Command Decision miniatures rules, Striker II allows rapid play which replicates the rapid tempo and quick reactions of advanced technology warfare. These straight-forward rules allow players to concentrate on the mental dilemmas of tactics and command, not the interpretation of complicated rules mechanics. Striker II provides the full science fiction combat experience with rules on orbital bombardment, drop troops, antimissile fire control, planetary environment, and orbital superiority. Campaign rules allow a sophisticated strategic gaming experience by adding the effects of combat engineers, maintenance, and quality of food and medical care." "Why did the Hivers assassinate Emperor Strephon? Why did the Hivers allow the Third Imperium to fall? What are the Hivers' plans for the future of humanity? There are those who say that nothing takes place in charted space without the Hivers having anticipated it, planned it, shaped it, brought it into being by patient, careful manipulation. What do you get when you cross a golden retriever with a box of razor blades? How is it that the most efficient, merciless killers in the universe don't have a mean bone in their bodies? If violence is natural, guileless, and innocent, does that mean one need not take it so personally? The Ithklur are the most feared warriors known to man. To an Ithklur, Vargr plunder is like a walk in the park; Aslan warrior spirit is the babbling of a toothless child. Other races make such a fuss over violence -- why not just do it and enjoy yourself? But as far as the Ithklur are concerned, they have the Hivers just where they want them. Who wants to be a boring taxi driver anyway? If the Hivers want to pretend they're in charge, what does it really hurt, so long as they leave the Ithklur alone?" TNE books were sourcebooks. Many had modules and adventures, but this was the first (and last) actual module. "Lilly Marlene was an amazing ship. I mean, I've seen some really well-maintained ships, but this was something different. No tool dings around the access panels. No cigarette burns on the plastic galley tables. No paint discoloration anywhere. 'Jeeze,' Greta said to me, 'this thing even smells new.' Greta was right. This wasn't a restoration job. Lilly was a brand new ship. And she was a Guild ship. And that added up to major trouble." Keepers of the Flame: The citizens of the Regency are citizens of the Third Imperium. They are the reverent guardians and sturdy repository of all that was great in that society, and they are pledged to carry its light back into the darkened universe. But this has not been easy. The effort to keep the Virus at bay took the better part of two generations, and absorned most of the energy and productive capacity this society had. And now, with the great external threat seeming to recede, old repressed rivalries are re-emerging, just as the Regency is poised to spring again into the stars. Enemies Within and Without: The Regency is burdened with a restive class of disenfranchised nobility, shunted aside by the wave of democratic reforms. Aslan Ihatei squatters within the Regency borders, never quite assimilated into human society, are beginning to call attention to their demands, both from the Regency government and from their clan brethren outside the Regency border. Vargr splinter groups, driven into the Regency with the decimation of their own societies, will stop at nothing to fuel the recovery of their homeworlds in the Wilds. Sword World irredentism is again on the rise. And as if that weren't enough, their stable neighbors the Zhodani now seem to be coming completely apart, wracked by internal war and flooding the Regency with waves of refugees..."
"Traveller referees have asked for a single volume to give to players of Reformation Coalition characters, a volume with all of the background information needed for roleplaying. This is that volume. 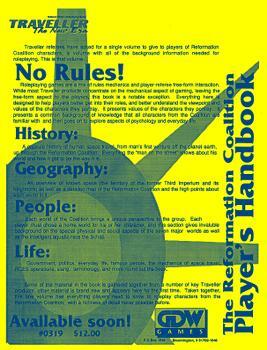 Roleplaying games are a mix of rules mechanics and player-referee free-form interaction. While most Traveller products concentrate on the mechanical aspect of gaming, leaving the free-form aspect to the players, this book is a notable exception. Everything here is designed to help players better get into their roles, and better understand the viewpoint and values of the characters they portray. It presents a common background of knowledge that all characters from the Coalition are familiar with and then goes on to explore aspects of psychology and everyday life. A capsule history of human space travel, from man's first venture off the planet earth, up through the Reformation Coalition. Everything the "man on the street" knows about his world and how it got to be the way it is. An overview of known space (the territory of the former Third Imperium and its neighbors) as well as a detailed map of the Reformation Coalition and the high points about each world in it. Each world of the Coalition brings a unique perspective to the group. Each player must chose a home world for his or her character and this section gives invaluble background on the special physical and social aspects of the seven major worlds as well as the intelligent aquatic race the Schali. Government, politics, everyday life, famous people, the mechanics of space travel, RCES operations, slang, terminology, and more round out the book. Some of the material in the book is gathered together from a number of key Traveller products, other material is brand new and appears here for the first time. Taken together, this one volume has everything players need to know to roleplay characters from the Reformation Coalition, with a richness of detail never possible before." This is an ad in the back of Guilded Lilly. The sword, or more properly, the cutlass of the highly trained Marine assault forces is wielded by pure TL-15 forces equipped with such vehicles as the legendary Imperial Marine Grav APC, Imperial Marine Fire Support APC, Imperial Marine Assault Gun, the Norris Battle Tank, and the Imperial Meson Artillery Vehicle. The Army's forces provide the major mass of Regency military power, and are expressed by such vehicles as the TL-15 Imperial APC and its Fire Support, Command, and Fire Direction Center variants, the TL-15 Heavy Grav Tank, the TL-14 Trepida grav tank family, and a variety of support units, including the Imperial Artillery Vehicles, Point Defense APCs, Nuclear Damper Carriers, Grav Sled, and Imperial Recovery Vehicle." This was one of our last projects. We only had a part-time art director at the time, who did the cover, and I did most of the interior paste-up. I got pulled off finishing Regency Starship Guide in order to make sure RCVG got out the door to the printers. The writing was on the wall for GDW at this point, but I think we had one of our most successful art collaborations on this one. It was very important that the technical details work, but we didn't have an in-house artist anymore that you could sit down next to. So Kirk Wescom, who did this as a work-for-hire, and I came up with a system. Each of the vehicles had a different, distinctive electronics suite, and I wanted to make sure the artwork reflected it accurately. Kirk and I sat down and worked out, "this is the antenna for this sensor, and that is the antenna for that communicator," and where they would go, and "this gun looks like this," and so on, and then I came up with a chart that showed what each vehicle had. And it worked like a dream, and they all came in perfectly. With one wonderful little gift from Kirk. 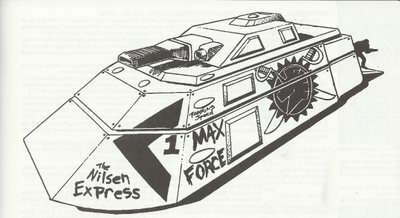 He had emblazoned "The Nilsen Express" across the side of one of them. My initial thought was, "I've got to take that off, people will think I did that on purpose." But then I thought, "no, this is a tribute from Kirk, and I have to let it stand for how he intended it." So it went in that way. It's one of the nicest tributes anyone has ever done for me, and I was really touched. Kirk was a classy guy. "This booklet contains 14 new forms for organizing, compiling, and sorting data for the maximum effectiveness. Three scales of maps that allow explorers to map worlds on a global, continental, or close-up scale. Because all of these use a common nested hex grid framework, maps can be used to zoom in for unlimited detail. The Trade Record Ledger allows records of every cargo and passenger run undertaken, with the kind of detail that will make your auditor weep. There's even a space for recording bribes. Because we're crafty, we even threw in stuff that referees will love — so you players let them have some too, okay? • NPC pages: for keeping track of those nefarious foes that dog your player characters' every step. • Ammo pages: for keeping track of all the lead and photons you send zinging around. • Animal Encounter Forms: because sometimes 80 tonnes of charging, slimy, pointy-toothed fury is more fun than player characters should be allowed to have just be careful, because if you have too much fun with this stuff the players won't share with you anymore. • The Starship Design Worksheet and Hit Location Worksheet help designers to keep their thoughts and designs organized in a common format. Once they are done, the designs can be recorded on Ship Data Profile forms, complete with space for an illustration." The Referee's Screen, Player Forms, and line of novels were things we did in response to distributors' demands for these products. The thing I liked about the Ref's screen was being able to illustrate the Covenanter-class ships that I named in honor of Stan Cherrie (VII Corps J-3 in Desert Storm) and Greg Fontenot. I don't think it was in the enclosed adventure, "Lady Elise," but in another article, I also used Greg Fontenot's real mother's name, Grace. In the Gulf War, Fontenot's battalion, 2-34 Armor did an in-theater swap from 105mm M1s to 120mm M1A1s. When they got their new tanks back to the FAA, they found that they didn't have radios, so Fontenot went back to the depot and asked for the radios back out of their old tanks. The officious prick at the depot said he wouldn't do it, Fontenot would have to come back with a note from his commander. So Fontenot wrote a note demanding the radios and signed it, "Signed, Greg Fontenot's mother." That was such a spectacular story that I knew I must honor his mother, so I created her as "Grace a Dieu Fontenot" in whatever article I put it in. "Lady Elise" was written over the weekend when I got iced into the GDW offices with Steve Olle. "Lady Elise" was in honor of Kirk Wescom's daughter Elise who was born that week. Kirk was the head of our art department, and one of the finest people I've ever worked with. Look for the smiley faces that he and Rob Lazaretti used to like to hide in their illustrations. They also hid the Close Encounters mothership behind one of those chimney-butte things in a Dark Con product. Oops, creaky memory. Turns out Stan Cherrie's name got put on a different ship of the Suffren Navy, the Lauritsen-class Unsupported Picket Ship (UPS), in a Challenge article. The other Covenanter-class ship was John Kain, another ODS commander kind enough to sit down with me (I think I quoted him on the Phase Line Smash box). I named the Lauritsen-class after our UPS driver, in honor of the number of times he saved our butts taking last-minute changes to the printer. Extremely rare first issue fanzine, which would later become a polished professional magazine. CONTENTS: A Silent Cry; Martial Arts for Megatraveller; White Wolf; Robots of the Imperium (by Thomas Stone); Plnetary Profiles; Trap of Triton; Again, Oytritsyu'a; Robots of the Imperium (by Charles E. Gannon); Robots of the Imperium (by Thomas Stone); Field of Fire; more. • Imperial Fragments: An addition to character generation by Mark "Geo" Gelinas and David McNeill"
ARTICLES: A Pilot's Guide to the Caledon Subsector - The long-awaited sequel to Gamelord's Guide to Drexilthar Subsector, by J. Andrew Keith; New TED government types; Astrogator's Update to Diaspora Subsector; The Mermani Descent - an RCES adventure; The Far Frontiers; Raid on Lobok; Strasse Weapons Systems, SC; more. 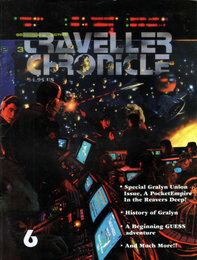 ARTICLES: Special Gralyn Union Issue, a pocket empire in the Reaver's Deep; History of Gralyn; beginning GUESS adventure; more. ARTICLES: Rock Called Jade - Far Frontiers adventure; The Intendant - Regency adventure with the Zhodani; Aikhiy - TNE GUESS adventure; Pilot's Guide to the Caledon Subsector - by J. Andrew Keith; Weapons Locker; Far Frontiers. ARTICLES: The Diafrenzo Long Trader; Advanced Recruiting Rules; Gold Fever: An adventure by Kevin Berry (with Andy Lilly); Double Cross: A RCES adventure by Marcus Zarra; The Izrats Kriezhlas Unity: A Vlazhdumecta state by David Thornell (with Grant Sinclair); Izh Kriezhlal (Yiklerzdanzh Subsector O): Description of the subsector by David Thornell (with Grant Sinclair); Hardware: New Cybernetics; Nova Ryll: Another RCES adventure by Marcus Zarra; Star Viking Personality - Vella Zabeth: A contact for RCES characters by David Burden; Hoshisame Class Gun Sloop; more. ARTICLES: Gabreelism; Children of Earth Timeline; New Era History; Terran Information Network; Sayings from the Book of Gabree-el; Aliens of Terra; The Vegans; A Long Way Home - Part 1 of a serialized novel by Terrence McInnes. 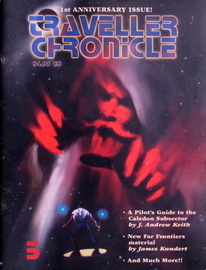 ARTICLES: A Long Way Home - The continuation of the serialized novel by Terrence McInnes; Children of Earth Errata and Additions; Terran Information Network; Psionic Time Travel; Small Arms of the Terran Republic; Official Terran Republic Marine Sniper Rules; Artifact - A Spinward Marches adventure by Clayton R. Bush; Amber Zone - Sudrian Wevo (Megatraveller era adventure); Out of This Universe - A Traveller variant; An Offer You Can't Refuse - Fiction by Mark Urbin; more. 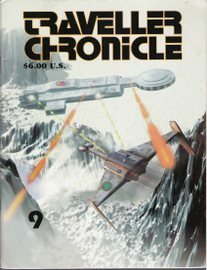 ARTICLES: A Long Way Home - serialized novel by Terrence McInnes; Biotechnology in Traveller; Terran Information Network; Assditional Skills for TNE; Space Travel, Trae and Commerce in the Terran Republic; The Kaguk System; The Kagukans; Soho Class Light Freighter; more. 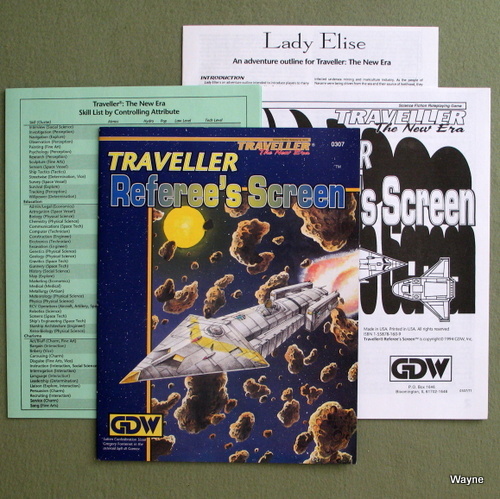 It's been over 10 years since GDW folded, taking its controversial last edition of Traveller out-of-print. 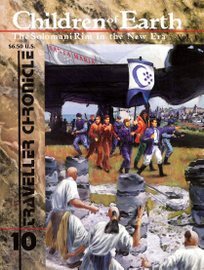 Traveller: The New Era took the Rebellion/Imperial Civil War of Megatraveller to Armageddon, and beyond. The New Era was a time of rebuilding interstellar civilization. 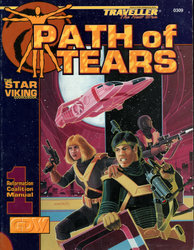 The setting was unpopular with many long-time Traveller players, who enjoyed the unchanging Imperium as a backdrop for their campaigns. 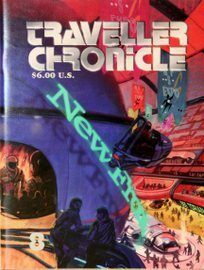 So it was no surprise that when Traveller saw print post-GDW, the New Era was forgotten. Indeed, two editions were printed in parallel, both avoiding the cataclysmic events of the New Era. 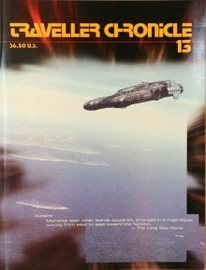 Marc Miller's Traveller (4th edition, or "T4") went back in time to the very beginning of the Third Imperium. T4 failed to catch on. 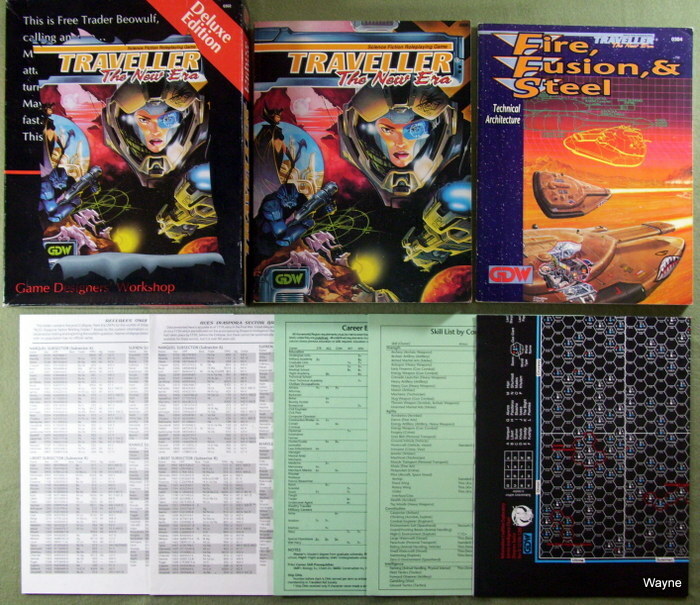 The other edition, quite popular and still in print today is GURPS Traveller. This setting literally said "The Rebellion Never Happened," and proceeded with a somewhat tranquil Imperium. Enough backstory. Fast forward 10 years, and the New Era is now revisited in this new sourcebook. Written by Martin J. Dougherty, with approval by Marc Miller, so Out of the Darkness can be considered "canon." The setting is nearly 50 years after the time period of TNE, and the book fills in the timeline behind it. Out of the Darkness is rules-independent, and can be mated with any Traveller rules set you prefer. 1. Answering the questions of the Rebellion and the Collapse. This is probably the strongest part of Out of the Darkness. Reading through this section, I couldn't put the book down. What happened to Duke Craig? Margaret? Strephon? The Solomani? You'll find out here. It is a story of last-ditch defenses, and civilization collapsing as multiple waves of Virus wash over them. The Empress Wave, what's behind the Black Curtain, all is told here, and it doesn't disappoint. 2. 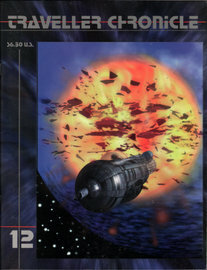 Events between the time set in GDW's New Era and the current day set in this sourcebook are depicted. I read through this section with vague discomfort, not sure what exactly it was bothering me. Yes, the Reformation Coalition and the Regency -- both staple settings of GDW's New Era -- get maligned. But the circumstances are plausible enough. Indeed, the Star Vikings' destiny makes more sense here than in GDW's New Era. There GDW wrote them as both idealistic do-gooders, yet reviled by history, a contradiction that never made sense to me. Out of the Darkness deftly explains this difference. Other political entities -- barely mentioned or unknown in GDW's TNE -- get a full write-up here. As all surviving organizations expand into the Wilds, their contact is long on squabbling, short on cooperation. I suppose it makes sense, but you'd think they'd be exhausted from 100 years of killing and death. Some brave peace agreements are made, but they are fragile. I think what became mildly annoying were the repeated RISK-style military invasions by all involved. Rather than sensible invade-then-consolidate military campaigns, many were 'push to the very end' drives to the capital worlds, often ending in the complete destruction of one or both sides. To be sure, this occasionally happens in wartime, and would be within the psychology of some of the political players, but it's a standard military strategy for all in Out of the Darkness. Insane pushes and cataclysmic battles make for great drama, but get a little tedious in repetition. Ironically, little has changed in 50 years. Instead of two entities in isolation -- the Reformation Coalition and the Regency -- in 1248 you have several governments with about roughly the same spread and strength in irregular contact. Most star systems in between are Wilds. The 4th Imperium, introduced here, has renounced expansion and is a minor player, leaving little indication of a bright future for reunification. Where the original TNE had the Regency as a setting for running "normal" Traveller campaigns, Out of the Darkness seems to lack a traditional background campaign area. I suppose the argument could be made that traditional players have ample in-print support through GURPS, but the exclusion here seems unnecessary. 3. The last part of the sourcebook explains and defines the current setting for play. 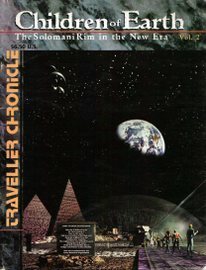 If you are already familiar with Traveller: TNE, then much is repeated from past publications. Still, it's good to have the information in one place. Overall, I'm satisfied with Out of the Darkness. The book is clearly self-published in appearance, but binding quality seems OK. I spotted typos every couple of pages, the kind that a spelling checker would miss: "To" instead of "too," etc. I also spotted a formatting error, a column heading that needed to be in a larger font and bolded. The manuscript needed another look with human eyes. Illustrations ranged from mediocre to good. I would have like to have seen more maps, given the amount of history and military campaigns covered here. Minor gripes aside, I am pleased with this addition to the New Era. Dougherty is a good writer who knows how to make history vibrant and interesting to read. As well, it is clear that a lot of thought went into the new setting. Well done. 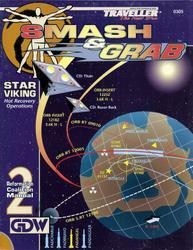 "Out of the Darkness, is a complete 168 page guide to Charted Space in the year 1248, published by ComStar Games. A century after the Third Imperium tore itself apart in civil war and dragged the rest of Charted Space down into ruin, Humaniti still teeters on the brink of extinction. But now there is hope. For emerging from the darkness are the powers of the New Era; the Fourth Imperium, the Terran Commonwealth, the Freedom League, the Zhodani Concord and many others. Diminished, battered and bloody, they remain as beacons in the night and as bastions against the howling tides of destruction. Out of the Darkness continues the story begun with MegaTraveller's Rebellion setting and moves forward from the early-reconstruction era of Traveller: The New Era. Compatible with all rules versions, Out of the Darkness presents an overview of Charted Space, with answers at last to the Big Questions of the New Era. The history section tells of the fall of the Third Imperium and the fate of each faction. The tales of the survivors are told as well as those who strove and failed. The bright defiance of Archduke Margaret's faction, holding the line to the end; the vainglorious grab for Capital by the Vilani Imperium and of course the horror that became the Black imperium of Emperor Lucan. From the Second Rule of Man to the New Lords of Kusyu; from the honourable Republic of Regina to the living hell of the Black Imperium remnants, each successor state is unique. Out of the Darkness presents an overview of each, to be further developed in future products. Between these fledgling empires lie whole sectors of Wilds, punctuated by pocket empires and trading alliances. An entire section of the book deals with conditions in the Wilds and how to generate UWP data for Wilds systems. Later sections of the book present answers to the big questions of the New Era universe - the Empress Wave and its effects on human space, the nature of Virus, and what lay behind the Black Curtain surrounding Capital. The fate of the Star Vikings is revealed as they forge Corewards to the aid of their lost human cousins. Finally, a complete setting for Traveller games in the New Era is presented. The County of Ukse lies on the very fringe of the Fourth Imperium. It is a frontier between the civilized interior and the untamed Wilds, a place where adventurers can make a fortune or meet a miserable end. Out of the Darkness has been more than a decade in preparation. Now, finally, the Traveller timeline can move forward into the future. This is the best of all possible worlds. Civilized regions, large powers jockeying for position, exploration and diplomacy in the Wilds and for the truly adventurous, the chance to carve out a pocket empire far from the borders of the large states. 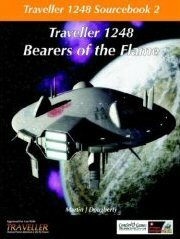 The 1248 Era will appeal to all types of Traveller fans." "Bearers of the Flame presents complete details on the Fourth Imperium, successor to the tragic Third. Bearers of the Flame presents maps and UWP data four entire sectors of space, ranging from the safe and civilized regions deep within Imperial space to the chaos of devastated Ilelish sector. Several minor powers are also detailed. These pocket empires may be enemies or allies, destinations or starting points for expeditions across the Wilds. This book is a complete guide to the greatest state of Charted Space in the New Era. Never before has the Imperium -- any Imperium -- been developed in such detail."